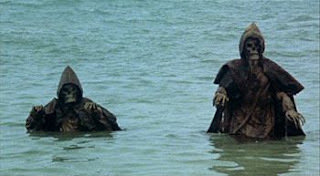 The Blind Dead return to hunt tender flesh on the high sea! Two models are out at sea in a new speedboat as part of a publicity stunt. Don’t ask, just go with it. Their boat is surrounded by a thick fog and a seemingly abandoned ship drifts out of nowhere. Radioing for help the models then naturally enough decide to explore the vessel and even more naturally enough, mysteriously disappear. Their belatedly concerned colleagues set out to find them; but not before consulting with a professor who believes that the ghostly ship contains the living-dead bodies of the Templar Knights! When our intrepid and fashionably dressed rescuers board the ominous ship, they too soon fall prey to the reanimated and blood-thirsty corpses of the Templars… Who are apparently just chilling out on a cruise. Following on from the Tombs of the Blind Dead and Return of the Evil Dead, Amando de Ossorio quickly churned out a third instalment of the Blind Dead films - The Ghost Galleon. The nefarious group of living-dead Templar Knights once again return to menace those unfortunate to encounter them. The Templars, medieval knights put to death centuries ago for their barbaric ways and love of all things satanic, rise from the dead as mummified skeletal beings, shrouded in their bloodied and soiled hooded garbs, to drink the blood of the living. As a result of having their eyes plucked from their hanging bodies by crows, they rely on sound to track their victims. Setting this film onboard a ghost ship seemed like a stroke of genius on Ossorio’s part. The potential for creating scenes of terror and claustrophobic tension is rife and the sight of the mummified Templars shuffling around the creepy, fog shrouded ship are disturbingly realised. 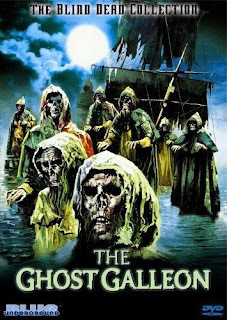 Unfortunately though, high hopes for an effective fright-fest should be abandoned, as The Ghost Galleon is by far the weakest and shoddiest film in the Blind Dead series. While the other films in the series aren’t exactly shining paradigms of great story-telling, acting, direction or writing, they are flawless compared to the vast ineptitude on display here. STARE! As morons vaguely search the ship for their friends. GASP! As they chew the scenery. BE AWE STRUCK! At their sheer incompetence. SCREAM! At their inability to use stairs. The woefully inept and panic stricken victims, with their pitiful, overdramatic whimpers, are utterly laughable. Their feeble protestations go on a touch too long. One of the most protracted and utterly mundane death scenes in recent memory unfolds as a particularly annoying character blunders and flails around making Tor Johnson look good. Stairs just fail this ‘blond bombshell’ as she bumps into everything around her before being pulled, rather gently, back down beneath the deck by extremely fake arms. Like most of the victims in the Blind Dead series, this lot just can’t get to grips with basic stuff like moving out of the way, or holding onto something to pull them away from the perpetually grasping claws of the knights. Locking doors proves an impossible task too. Slack-jawed idiots. The spectral galleon itself is incredibly creepy. However, nothing can disguise the fact that many shots of the ghostly ship are of a model. Ossorio does at least try to distract from this by filming it from obscure angles and from under water. One well executed aspect of the film is its sound design. The noise of the ship as it constantly moans and creaks really adds menace and a foreboding feel to proceedings. The misty and dank sets full of eerie lighting and rumbling noises, and the sight of the Templars emerging from the crates in the hull of the ship, are as nightmarish as anything in the previous films. The scenes when the Templars rise up en masse from the depths of the ship are also effectively ominous. Unfortunately all the nightmarish stylisation is lost without a decent script to enhance it. As with Return of the Evil Dead, The Ghost Galleon also appears to have had a major influence on John Carpenter’s The Fog (1980) with its maritime spookiness - a theme Ossorio would continue in his next Blind Dead film, Night of the Seagulls. When the remaining survivors eventually make it back to land, with the help of a plank of wood, they collapse on the beach and erm, go to sleep. Their plan to throw all the coffins overboard (which is as tedious as it sounds) is about to backfire spectacularly. We are soon treated to some magnificent shots of the blind dead emerging from the sea and lumbering onto shore; sea water streaming from their empty orbs. A striking and pretty chilling final shot ensures the film closes on a distinctly bleak note. Just as well we really didn’t give a damn for the characters after all. Without a doubt the weakest entry in the series, The Ghost Galleon, with its buckets of eerie atmosphere and ghoulish imagery, could have been a really shuddersome film. However, with no plot to bolster the spine-tingling visuals or add anything that even remotely resembles impact or interest, the resulting film is a let down. As dreadful as it is, the combination of terrible acting, guffawing dialogue, shoddy direction and all-round laziness actually elevates The Ghost Galleon into the sublime realms of ‘so bad, it’s good.’ Enjoy with a generous glass of wine… Or five.